A nanostructure fabricated using EBID. (Phys.org)—Techniques for the manipulation of matter at the nano scale are a step further ahead with the publication of new results from a UTS research group. A team of physicists funded by FEI Company and the Australian Research Council have unveiled new physics behind the nanofabrication technique known as electron beam induced deposition (EBID), essentially 3D printing at the molecular level. The UTS team has reported new insights into the behaviour of molecules at surfaces to achieve extraordinary improvements in speed and the quality of materials fabricated using the EBID technique. 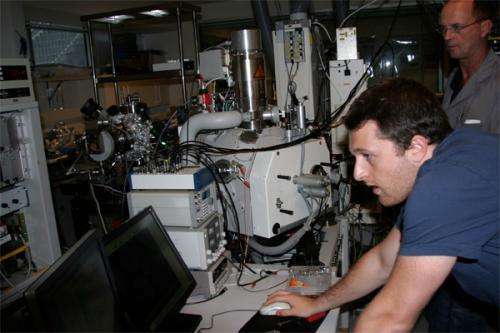 Using the UTS FEI laboratory and an advanced research grade electron microscope the scientists have been able to explain the nature of chemical reactions on hot, solid surfaces and to "write" highly pure nanostructures. The research team at work in the UTS FEI laboratory. The UTS experiments have led to the discovery that the EBID technique performs optimally under conditions previously dismissed as ineffective, due to gaps in prior understanding of the basic science behind EBID. 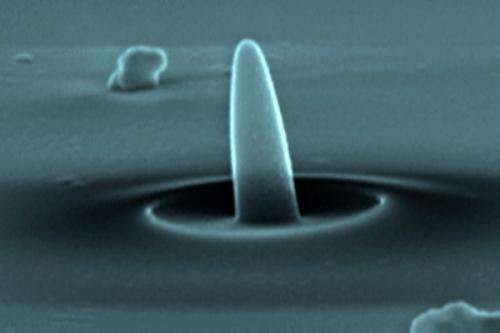 One of the researchers, Professor Milos Toth said, "Techniques for manipulation of matter at the nano scale critically underpin the development of future generation electronics, photonics and materials used in renewable energy technologies." "Our findings help advance the techniques and build the machines used to advance nano scale science and technology." "These discoveries are enabled by the cutting edge FEI equipment used by research staff and students at UTS," Professor Toth said. See more details on the research and the findings in the journal Physical Review Letters. Especially when we think about going into space the ability to manufacture any needed structure from first principles will be an immense boon - because it frees you from taking most any kind of supplies with you. If we can one day couple this with the reverse - disassembling structures into its constituent atoms/molecules for reuse - then we'll be truly independent of everything save for the need for energy. Well, the 3d printing looks to get advanced enough to build arbitrary molecular structures, hence machines; it could build molecular machines that can break apart molecular structures into their constituent atoms. I kind of like the 3d printing and electron beam patterning of graphene(and even generalisations to other single atom thick structures using other atoms besides carbon); it avoids the replicator problems(actually not much of a problem; these are machines, not living things; a single molecular fod can take out a faulty molecular machine). There was reported today as well nanometer precision patterning of graphene; combine these two, and one can start to make lots of nanotechnology happen.